We never intended to co-sleep, the day before my due date, my dad took me to John Lewis to buy a beautiful white cot for the nursery. Even though I knew the baby would be sleeping in our bedroom for the first six months, I wanted the cot to be set up so I could feel that the nursery was finished. We had borrowed an adorable moses basket off a friend, with the intention of keeping it next to our bed for the first six months My daughter was born just after 9am one morning in our living room. After some skin to skin, a feed, and a costume change, she was getting sleepy. I was way beyond sleepy at this point, delirious in fact. We headed upstairs to bed, and lay her down in the moses basket fast asleep. I stayed awake gazing at her for a while, and talking excitedly about the birth, feeling completely in awe of everything, then I finally drifted off to sleep. We spent that first day sleeping, feeding and falling in love. The next few weeks are a blur of visitors, cold cups of tea and long feeds. But what I do remember, what I'll never forget, is the crushing tiredness I felt at that time. Every inch of my being ached from exhaustion, it made my teeth hurt and my eyes sting. My daughter was nocturnal for the first week or so, spending the nights feeding and restless. I spent my days surrounded by visitors, unable to make conversation or even focus my dreary, aging eyes. Laurie and I took turns to sleep, working in shifts throughout the night. During my shifts, try as I might, I simply could not stop myself from falling asleep. I was just exhausted, and there was nothing I could do to stay awake. I often woke up, startled, holding Ebony on the sofa. At the time, I thought that must be safer than falling asleep with her in a bed. But I quickly discovered that I was wrong. I mentioned this accidental sofa-sleeping to a friend who visited in those first few weeks. Her boyfriend looked shocked, and told me about a friend of a friend whose baby had suffocated this way. Visiting new parents and telling them stories about infant fatalities is probably not always a good idea, but I'm so grateful that I was told that story. That night, as I lay awake with Ebony, I started researching co-sleeping. I read lots of websites and blogs about how to co-sleep safely, and all of them explained the dangers of falling asleep accidentally with your baby, both on sofas and in beds. Co-sleeping, it turned out, was safe, but only if done properly. You can read some safe co-sleeping guidelines here. A couple of weeks later, Laurie went away overnight with work. 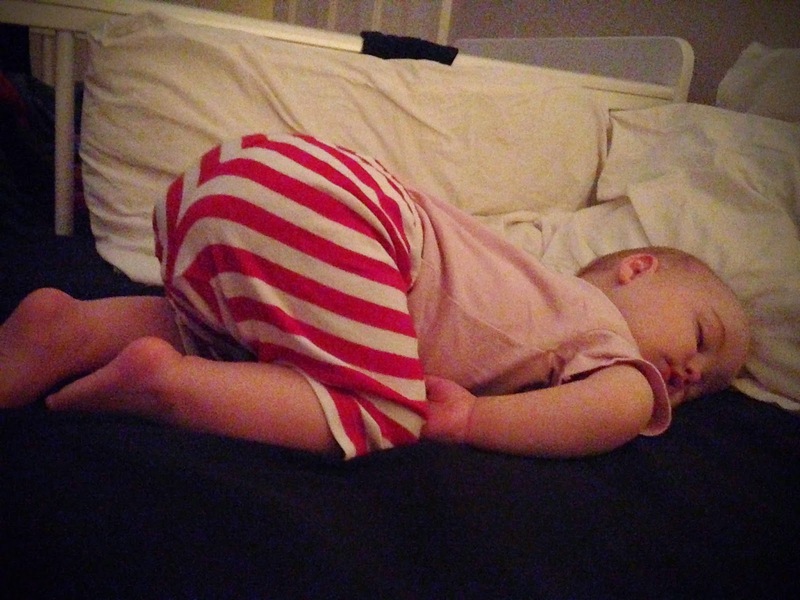 As I was putting Ebony to bed that night, I decided to give co-sleeping a try. That night, I had the best night sleep I'd had since Ebony was born. Night feeds were less disruptive, Ebony woke less and fell back asleep more easily. From then on, we co-slept. I moved the cot so it was pushed up against our bed. Ebony would start the night in the cot, but come into our bed when she woke. Co-sleeping was wonderful, and I'm so glad we did it. I felt safe knowing my baby was nearby, and I think she felt the same. We co-slept long into toddlerhood, always planning to keep her with us until she turned three. Sleeping near to parents reduces stress for the child, aids brain development and is good for the baby’s heart (more here). A couple of months ago, when Ebony was almost two and a half, we went on a family holiday to Spain. We had a two bedroom apartment, and as soon as we arrived Ebony announced that the little bedroom was hers. And when it was bedtime on the first night, she went straight into a single bed and fell asleep. This was all completely unprompted and unexpected. She slept in that bed for the rest of the holiday, but did spend at least a couple of hours in our bed each morning (because, really, who wants to get up at 5am on holiday?). We had recently moved house, and the week we got home from Spain, a single bed arrived for her room. We never intended for her to sleep in it just yet, but wanted her to have time to get used to it, and let her decide when she slept in it. When the bed was set up, complete with Save the Planet bedding, Ebony couldn’t wait to sleep in it. She was excited to sleep in her own bed (“little one”) on the first night, and lay with her head on the pillow with her eyes excitedly clamped shut for a while before actually falling asleep. She has slept in her bed every night since, apart from one night when she was ill and wanted to stay with us. She is usually asleep by 7:30pm, and creeps back into our bed sometime around 4am for another couple of hours of sleep. Either that or I wake, crippled, in her bed with its ridiculously soft mattress. If she wants to come into our bed in the middle of the night, that’s fine, or if she wants me to join her in her room that’s (back-achingly) fine. She’s only two and a half, and while she may sometimes seem pretty big to us, she is still very young, and it’s fine if she wants to sleep near us. I am sort of sad that our co-sleeping journey has come to an end(ish), and that my little baby is growing up. But, also, she is getting pretty big, and it is a relief for me to be able to lie on the bed, as opposed to hanging precariously off the edge all night. I’m glad she still comes in for a couple of hours in the morning, because it’s nice to have those cuddles, but I do like having my bed back.